15 min to Seattle, Bellevue & the Whidbey Island ferry. 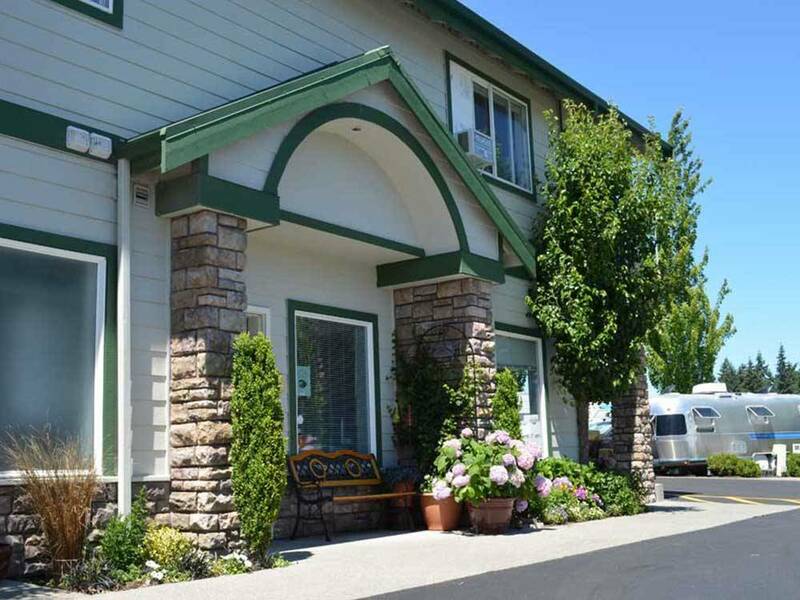 Few RV resorts rated by Good Sam and AAA can compare with the standard of our resort. 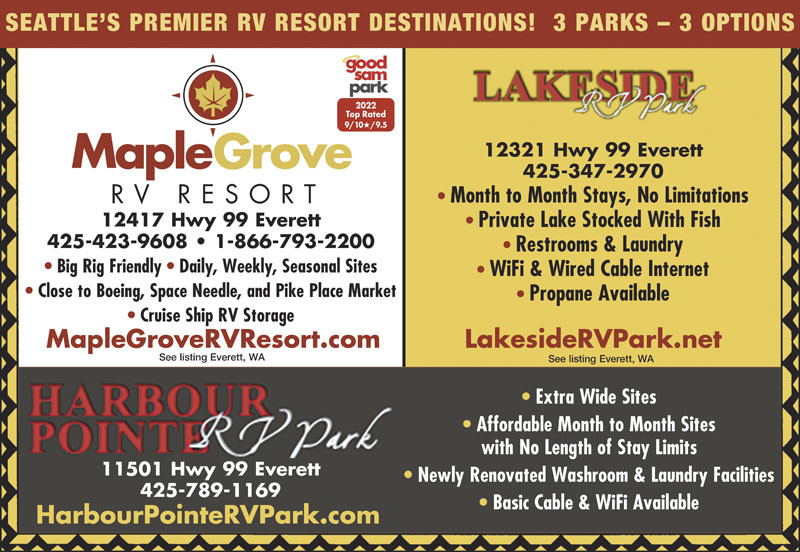 We are YOUR premier RV resort when visiting Seattle, WA State and the Pacific NW. We have family in the area so try to stay as close as we can to the city. There aren't a lot of good options. This place is very convenient for us but challenging. We drive a 40' motorcoach with a tow car. Tight but doable maneuvering through the park. Space was VERY narrow and NOT LEVEL. We were able to open our slides and squeeze our car onto the site but were right up against the hedge. Not noisy on our stays there. Hook ups were OK. Not a great part of town (street lined with cannabis shops) but this is a pretty protected enclave, but not gated. For an overnight this would be OK. Sites are exceptionally tight. We needed a spot over Labor Day weekend and this was all we could find. We have a 40' motor home with a tow car and the site we were given was 41' long and 22' wide. We could barely open the car door. Additionally the site was so unlevel we had to not only block up the jacks but put wood blocks under the back tires. The staff was very friendly and accommodating. The bathrooms were slightly dated but very clean. The dumpster for garbage disposal was a mess and in desperate need of attention. If you are over 36' long, make sure you get an interior site, those are longer, but still very unlevel as many people had wheels off the ground or were blocked up. No tables at site. Uneven pads required blocks or cinder blocks to level. Limited space along side coach. Loud music coming from 2nd floor apartment over the office. Narrow driveways....very tight spaces. Pass this place and opt for another park. BTW the rate was $75.00 for a poor choice. This park is only marginally better than dry camping in a parking lot! The sites are tiny, if you have slide outs AND a towed, you'll have a heck of a time getting them all within the painted lines of the site. If you have dogs, GO ANYWHERE but here! They have "rules" (more about that later) and one is where you can walk your dog. Either on rock, foundation size rocks, that are uncomfortable to walk on a best or in the "dog walk at the back" which is thru a locked gate and into the alley. The alley is overgrown with fox tails and runs along a housing project and hubby found hypodermic needles strewn about! Yikes! The danger from the needle and then the danger from the users!? I say, never again!!! Now about the park rules...one is given the rules upon check-in. Pretty much par for the course. But then, they come around & scotch tape a memo to enforce the "rules" that one is then offered again. They beat upon the smoking rules, and we do NOT smoke...so, please do not put tape on my paint!! I get that there are fire dangers, but seek out the culprits, not the innocent! Please, if you must stay here, be very, very careful! Maple Grove is a mixed bag. We stayed three nights in a 40' motorhome. The grounds are nice. We did not use the restrooms or the laundry. The only problems we encountered were the size and levelness of the sites for a large rig. In order to accommodate a big rig, they assign you two smaller sites that back up to each other and thus create one "pull through" site. The problem is that it was extremely difficult to get even close to level and then there was no room for our toad. The other sites appeared to have the same issues so all of the vehicles were parked barely their sites, which made for a crowded and difficult entry and exit from the site. Centrally located in Everett. 30 minutes to downtown Seattle if no traffic (rare) otherwise 45-50 minutes. Park very clean; overflow parking available. Restrooms with showers and laundry facilities were clean and accessible any time. Pet friendly but exercise area for pets was accessible at back of park thru electronic gate that lead to an alley/pathway that was marginal. Spaces/pads (all paved or cement) were clean but tight; especially for slide outs but expected for central city location; we had a back in site for our 32 foot double slide. Parking for pull vehicle was tight. On site staff were extremely friendly and helpful. Shopping close by. Overall a nice/friendly park; would stay there again on our next visit. Great people run the park, VERY friendly. It's a "in town" park, paved sites, easy access, our site was perfectly level and wide enough to park the car beside the coach. A nice greenery barrier between sites. Very good wifi. We were there for over a week and will be back.